Here are a few pictures of day 2! Waiting for the main doors to open for general session. Cindy and I during general session. 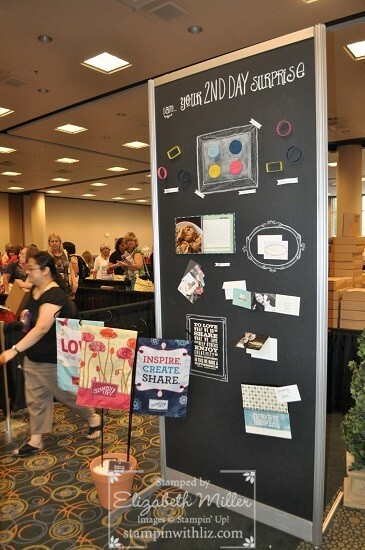 During General Session, Shelli announced a few new items that were available in Memento Mall, so I went and purchased a few things (garden flags, cookie cutters, and the business sweet pressed cookie press)! Today’s classes were “I am Having Fun” lead by Shannon West, her presentation was a brilliant reminder that above all, our stamping events need to be FUN! She had us on our feet and dancing (literally), laughing, and smiling. I think I snorted when she showed a clip on exercising your facial muscles. Followed by “I Am Reaching Out” taught by Emily Montoya. I also really enjoyed Emily Montoya’s “I am reaching out” class. It was a little based on our keynote speaker Jason Dorsey but I did relate to much of what she said. If you simply look at birthdays, I fall into “Generation Y”, but I definitely relate more to Gen X and especially when it comes to technology, I was happy to get some advice on how to better communicate with some of my customers! Tami’s team dinner at Macaroni Grill.